At World’s End, a peninsula in Hingham 15 miles south of Boston, wooded trails mingle with a beautiful harbor view. Part of a series on New England parks and their people. For more, click here. HINGHAM — One of the first things you notice as you enter World’s End is its rich smell, a refreshing mix of ocean water and the earthiness of red cedar trees. That blended scent, and the nostalgic feeling it brings, is a microcosm of the summer experience at this majestic conservation area of trails, meadows, and rocky shores, where a hike in the woods leads to the water’s edge. World’s End, a peninsula about 15 miles south of Boston that is managed by the Trustees of Reservations, is a sprawling landscape that juts out from a residential neighborhood in Hingham, not far from Route 3A. Carriage paths, designed in the late 1800s, take visitors on an ever-changing adventure — up hills, through woods, down thin rocky trails, and onto tranquil beaches. Under an I-93 overpass, skaters practice their tricks and feel free, enjoying a rare opportunity to be competitive only against themselves. 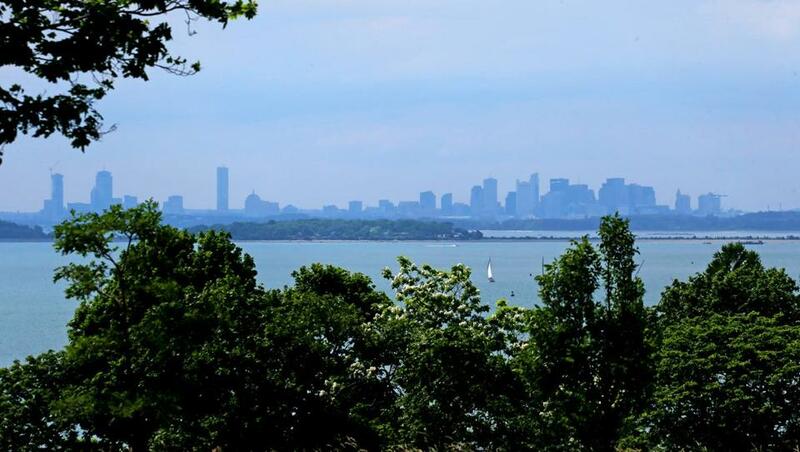 Perhaps the park’s highlight, which comes as a reward after a steep climb, is Planters Hill, which delivers a stunning view of the Boston skyline. To the north and east, Hull’s picturesque shoreline homes can be spotted through the trees. A view of the Boston skyline is the reward after climbing Planters Hill. Around every turn, over every hill, World’s End offers a fresh view of the trees, sky, and water. On a recent visit that fell on the first day of summer, the sun glistened like diamonds off Hingham Bay as leaves rustled in the cool breeze. 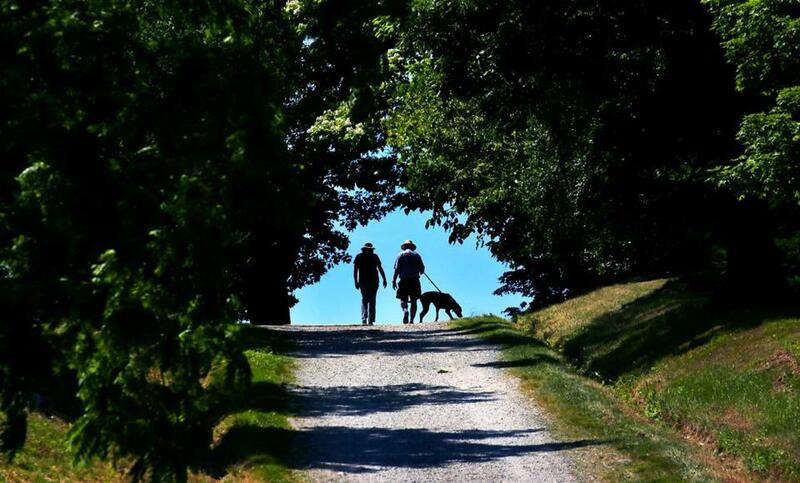 As she strolled across the narrow strip of land connecting the two main parts of the park, Cathy Rash said World’s End was a bit of heaven on earth. Rash comes to World’s End about once a week. She especially loves walking along the pebbly beaches at low tide, when all you can hear is the water lightly rippling over the small dark rocks as geese swim nearby. Further along the paths, under the canopy of the trees, birds and chipmunks hop and scurry in the grass as children yell playfully from boats in the harbor. There are benches along many of the paths to sit and enjoy the view. At 251 acres, World’s End has a boundless feel that belies its name. There always seems to be a new path to explore, another hill to climb. Some of the hills have a gentle slope that makes it feel like you are walking straight into the sky. One off-the-beaten-path gem is Rocky Neck, a network of thin forest paths that create a more traditional hiking atmosphere. Some of the paths lead to rocky perches high above the water. Along some of the paths farthest from the park entrance, greenery takes over in all directions, and it’s easy to forget that you’re in the middle of a heavily developed region. That World’s End remains untouched is fortunate, since it was nearly developed on several occasions. In the mid-1800s, Boston businessman John Brewer acquired the land and built a farming estate near his mansion. He planned to turn it into a subdivision, hiring famed landscape architect Frederick Law Olmsted to design it in 1889. The carriage lanes were built, but the homes never were. Nearly 60 years later, it was on a short list of potential sites for the United Nations headquarters. In 1965, it survived a proposal for a nuclear power plant. Two years later, the Trustees of Reservations, a Massachusetts-based land conservation organization, acquired the property, and has preserved it ever since. Maddie Connors, 18, of Whitman, visited the park for the first time recently and said she hopes to be back soon, struck by the immersion in nature that World’s End provides. The Trustees charge a fee for the park for nonmembers: $6 on weekdays and $8 on weekends and holidays. Children get in for free. World’s End stretches so far it can seem empty at times, a magical escape from the busy world around it. On this June day, dozens of families slowly climbed Planters Hill for a picnic celebration with live music and guided walks. As the tide came in and the sun set over the Boston skyline, it was clear that summer had begun. World’s End has a number of trails and paths, including this one headed uphill.